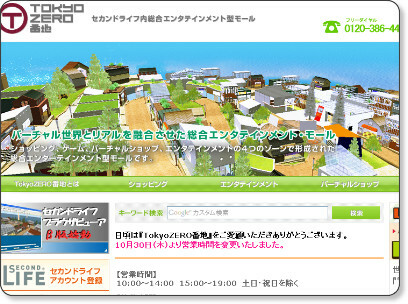 Meltingdots, a Tokyo based company which specialize in virtual worlds, has supported many companies to get a Second Life presence (for example, Suruga Bank which we blogged June 2007 at MindBlizzard). Recently they partnered with Weblin, one of the web based avatar chats, and started to offer several interesting services using Weblin. Recently they have live-streamed a video of a concert. Fans who couldn't attend the concert joined together at a website as Weblin avatars and enjoy chatting with other fans while viewing the streaming-video. I asked Hiroshi Asaeda, CEO of Meltingdots, about Weblin and the future of Second Life. Q:Now you're focusing in Weblin. What's the advantage of Weblin? Easier to join, on a web browser. As we were working on Second Life, I noticed the most important part for SL wasn't 3D, but real time communication. 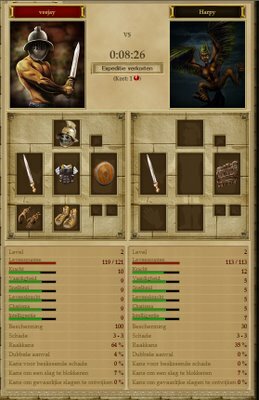 SL still has a huge barrier to join, and I thought Weblin was one solution which could bring in more normal people (meaning computer users who are not geeks) to experience online communication. Using Weblin is just like using Skype, and is easy to download for these people. Also, Japan has a culture of not wanting to show their real identities, and prefers to use avatars. As long as people aren't desperate to use cool 3D designed offices, I thought it was good enough to communicate using a web browser. How was the Weblin + live streaming? 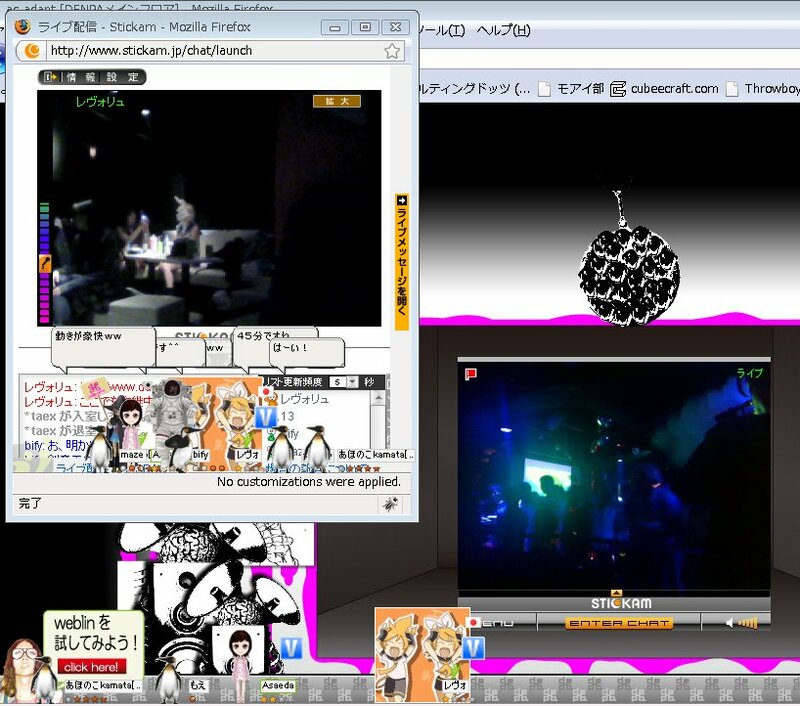 The Weblin live streaming with Denpa worked out pretty well. Even though it was a daytime real club event, the people who lived away from Tokyo attended the virtual live. Although we had some trouble in the live streaming itself, we thought there are huge opportunities to do events with Weblin. What do you predict about Second Life or other virtual worlds in 2009? Meltingdots still thinks Second Life to be one of the most innovative social services in the world. No one is coming even close to them, but I think they need a visionary so the users will keep believing them. What we first need to do before using Second Life is to have more people get used to using avatars as themselves. Weblin is a good way to start out, and when the users get bored with the flat interface of the 2D web, that's when the 3D virtual world business begins. We will continue SL until this day comes. Disclosure:Meltingdots is the sponsor of Avatar Watch, which is my main blog. Sun inc, one of the leading companies focusing Second Life business in Japan goes bankrupt. On Nov 16, Sun's CEO Okui was arrested for helping a lawyer go abroad. The lawyer, who seems to be the owner of Sun inc actually, was evading tax. Then a notice about bankrupcy was posted on Sun's website on Nov 21, stating Sun's negative networth is at least US$5 million. Sun had released Second Life viewer for PC and mobile(Sun Inc Second Life Browser Viewer (Beta)), and was trying to built e-commerce platform called "Tokyo Zero" in Second Life(it enables users to buy real bags, clothing by Linden Dollars). Sun's got funding from Acrodea(mobile solution provider), Hakuhodo DIY Mediapartners(agency), Fullcast Markting and Ngi(venture capital which is also the owner of 3Di inc). 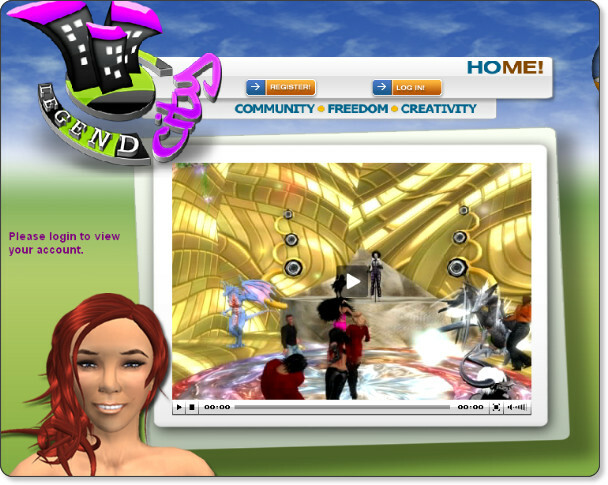 Last week I visited 2 virtual worlds which are based on the OpenSIM platform, Legend City and Dreamworld. First one is "Legend City". To get an account, visit the site below. Legend City has its own currency "Legend Dollar"(200 Legend Dollar is equal to US$1). I could find its KIOSK in Second Life, paid 2000 Linden Dollar and got 1333 Legend Dollar. After that, i downloaded the viewer and launched. Here's fa irst snapshot of it. When i visited Legend City, it's difficult to walk straight or to stay upon floor. One interesting thing is popular stores in Second life have their own stores in Legend City(Simone, for example). This world may attract fashion lovers. Second world on the list is "Dream World" in China. 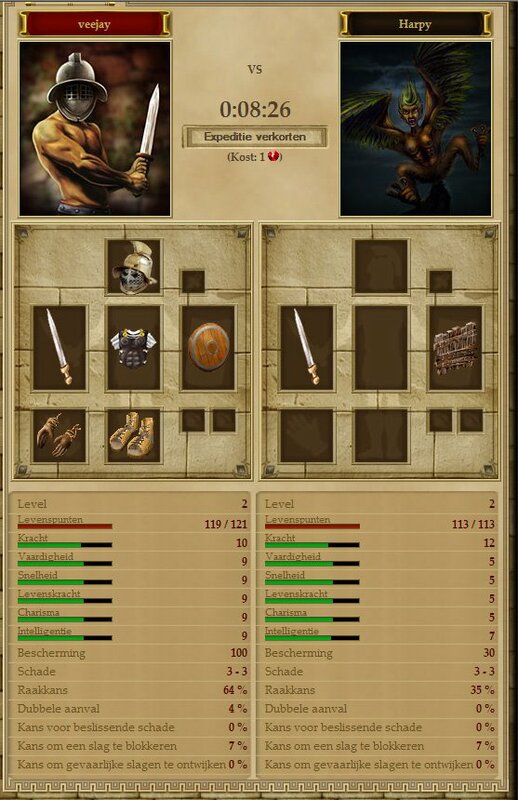 The first snapshot of its client viewer. Dreamworld isn't very large yet, I found about 10 Sims on the map. This is a lounge for English speakers. This exibition hall might be inspired by last summers' Beijing Olympics. When I visited this world, I couldn't find anyone. I visited at prime time and there is no time difference between Japan and China. In the past months I've blogged quite a few times about the use virtual worlds in visualising and understanding history. One of these examples was IBM's recreation of the Forbidden City in China and I also blogged how cool it would be to walk more of these Ancient Sites. "From about the day I signed on to Ancient Sites I've had the believe that this had the potential to change our Educational system in the way which students could globally interact, learn languages, geography, history, art and you name it." There are many ancient sites I would like to visit. In real life I have walked across the ruins of Olympia, of Mycaena and Sparta but one place I like in particular is ancient Rome. Currently I act as a Gladiator in the online game Gladiatus (by the way, I changed my handle from VeeJay to Verritus in this game) so Iam pretty excited of yet another Google thingy. Although I got pretty negative on Google yesterday in their quest for world dominance, this is a cool thing as they bring the 4th Dimension into Google Earth. Here's the full story from Thomas Clayburn at Information Week. The mayor of Rome, Gianni Alemanno, on Wednesday invited the hoi polloi to visit Rome in Google (NSDQ: GOOG) Earth. Not modern Rome, but the Eternal City as scholars believe it was in 320 A.D., based on the Rome Reborn model constructed by the University of Virginia's Institute for Advanced Technology in the Humanities. "What fascinates me most about this project is the accuracy of the details of the three-dimensional models," said Alemanno in a guest post on the Google blog. "It's such a great experience to be able to admire the monuments, streets, and buildings of Ancient Rome with a virtual camera that lets you go inside and see all the architectural details. From the Colosseum to the Ludus Magnus, from the Forum Caesar to the Arch of Septimius Severus, from the Rostra to the Basilica Julia, you can get up close to them all." To view the new Ancient Rome 3-D layer in Google Earth, open the "Gallery" folder in the "Layers" panel and select "Ancient Rome 3-D."
This marks the first time an ancient city has been incorporated into Google Earth. "Going back in time presented some new challenges, such as how to handle the ancient terrain which was clearly different than modern day," explained Google Earth product manager Bruce Polderman in a blog post. 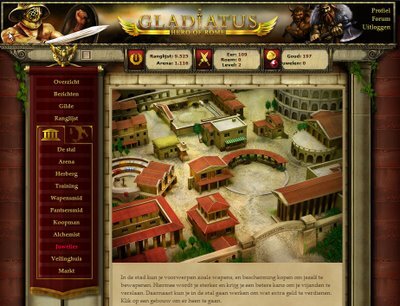 "We needed to ensure that modern day imagery, terrain, and buildings didn't interfere with the ancient Rome model so we opted for a simple overlay." In conjunction with the debut of the Ancient Rome 3-D layer, Google is sponsoring a curriculum competition for K-12 educators. Teachers interested in participating can sign up, waive assorted rights, and submit a lesson plan and supporting materials in the hope of being among the top six entries. Prizes include an Apple MacBook laptop, a digital classroom projector, a digital camera, a 3-D navigation mouse, $500 in gift cards to Target or Office Depot (NYSE: ODP), and an engraved Google "Top Educator" plaque. In Second Life we often see people trying to shape their avatar as much as possible to their Real Life appearance -kinda counts for beach babes and sixpack Joe's I guess - or the other way around, people shaping their avatar in their ideal sort of way and then try to become like this ultimate adonis in real life too. With this combined technology Philips will provide the change to bring this a step closer. Soon we will be able to project those textures and skins from Second Life on our own skins and clothing. In this article I focussed on the way we take virtual stuff and try to add them to our real life selves, but the other way around works as well of course, which I tried in June last year at Avatar Island in which I did a testdrive of the CyberExtruder software. Big Stage, a personal avatar virtualization service introduced in beta form earlier this year, has its official launch today. The company has marked the moment with more choices for use of their own unique “@ctor,” as well as an updated media player and social sharing functions. The so-called “@ctor” is a user’s 3D facial representation, which the company calls “The Digital You.” The user can subsequently insert this representation into a myriad of places, like still imagery, social networks, video games, virtual worlds, music videos, TV clips, and even advertisements. An @ctor can be animated through the Big Stage Media Player. Read Full article at Mashable. Linden Lab are offering $10K for projects that improve real life through virtual world. Work in Second Life that also achieves tangible, compelling results outside of Second Life. Distinctive, original work using Second Life that clearly demonstrates high quality, execution, function, aesthetics and technical sophistication. Work that has the capacity for inspiring and influencing future development, knowledge, creativity, and collaboration both inside and outside of Second Life. The price money offered is a substantial increase from previous initiatives (which in my opinion have been nothing but shameless crowdmining projects), including USC's "Public Good" challenge that offered $1,200 to three winning projects and the Foundation for Rich Content which has been providing small grants of $80 for projects that enhance Second Life in some way. However, with 10K in the offering, I doubt it will be enough to attract larger real life businesses to compete and in the passing make a difference. For individual entrepeneurs and Metaverse evangelists, this might be a daring opportunity though. Entries for this innovation contest are due January 19. See the Linden Prize site for further details. A few weeks ago I made a few remarks about the new fanpages on plaxo (currently in beta) on twitter, which got picked up by John McCrea, head of Marketing at Plaxo. About the same time I blogged Yahoo's oneConnect in which I wondered what the differences were with services like Plaxo. In my book, Plaxo didn't have the best of starts, as it carried the smell of Napster. Way back in 2004 David Coursey wrote a (2nd) article on Plaxo, titled "Plaxo Reconsidered" at eWeek.com. The big issue was that one of Plaxos co-founders, now departed, was also a co-founder of Napster. 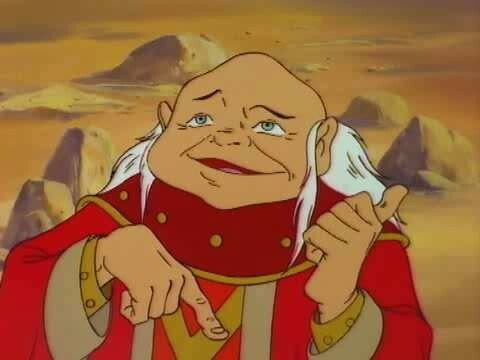 That company, of course, was basically about enabling people to steal other peoples intellectual property. My own opinion is that some Napster people should have ended up in jail. After the Napster meltdown, Plaxo was positioned as the "next big thing" for this ex-Napster exec. That publicity helped Plaxo raise $20 million in venture money and gave the new company more credibility than it would otherwise have had. I don't want to get into the Napster story here, and just concentrate on Plaxo. I think the Napster background serves well in positioning the founders as being early experts in networking and understanding the power of virals. What I wonder though is, what were the initial thoughts on Plaxo? What was it that the founders envisioned. What was Plaxo supposed to do, or grow into? And what's still standing of that original conception? Although I was not there at the time (as I joined in 2006), the original concept was to help people stay connected by leveraging the power of a networked address book. But not just another online address book, one that synced with the various tools you used, like Microsoft Outlook or the Mac address book. The vision is still pretty much the same, but the challenges of staying connected have expanded in a world of many different social apps. 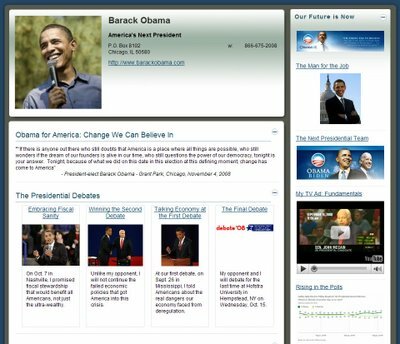 That’s what gave rise to Pulse, the first social web aggregator, which brings your address book to life, with feeds from your connections from all over the Web. What’s interesting to note is that the original “grand vision” observed that the Internet was missing a “people layer.” Now, as web itself is going social, and the Social Web is going open, that grand vision is looking smarter with each passing month, as we help a new “Open Stack” of OpenID, OAuth, XRDS-Simple, Portable Contacts, and OpenSocial come together to enable exactly that. Given that I consider Napster money and influence to be tainted, I was immediately concerned about Plaxo, especially when I couldnt imagine how they could turn the company into a huge moneymaker without doing something shady. There were other things Plaxo did, such as keeping track of how many information requests Id received and using the number in e-mails to try to convince me to sign-up. That seemed a bit like stalking and, along with a few comments and rumors Id heard about the company, only intensified my concern. His initial hesitation against Plaxo is one I share, but this wasn't untill sometime early 2007, when I started receiving tons of invites untill finally almost everyone in my company was using Plaxo, so I signed up also. I reckon many people have felt that initial hesitation. Did it affect the way you did business in any way, did it temper your expectations for the platform? When most invites at that time were generated by my professional network, I assumed Plaxo would take on the competition with LinkedIn for instance, being a profiling site plus extra features to lifelog. When looking at the current profiling options, it looks like it's somewhere in between LinkedIn and Facebook. Was Plaxo aimed at professionals to take on the competition with LinkedIn? Plaxo has always had a broader vision than simply “business networking.” We are keenly focused on providing a better way to stay connected with the people you know and care about, rather than being a service that is for “networking” or connecting with people you don’t know. The latest addition to Plaxo are the fanpages in which you can sign up as fan of a tv series. Right now this feature is only available to US residents. Are there any plans to go beyond GEO blocking and make this feature available worldwide? The geographic restrictions are not Plaxo-specific, but rather come from the content sources. You’ll note that everyone in the space is dealing with the same issue. Considering this latest addition, is Plaxo moving away from say LinkedIn and moving closer to Facebook, from business oriented to more social oriented? We aren’t moving toward or away from either company. We are continuing to move further down the path that we started upon back in 2002. Plaxos current mission is to reach 10 million users and $10 million in annual revenue as quickly as possible. Right now they are at more than 3 million users and essentially zero revenue. The Plaxo execs asked that I not pre-announce their forthcoming products, but they discussed them in enough detail that I have great confidence that Plaxo wont abuse its customers. A key part of their plan is finding other services that Plaxo customers would be willing to pay for. There is no plan to discontinue the free service, only to add revenue-producing products to the offering. Well, I figure you've more than doubled the 10m users now, but where are we with revenues? This previous quote, as well as the first one about the 20m VC gets me thinking about the Business Case behind Plaxo. I've discussed this with colleagues of mine. Maybe it's because we're Dutch, but we just can't see where the money is to be made. Signing up is free, there are hardly any adds and datatraffic streaming all the lifestreams must be huge. Where's the return on investment for Plaxo? The return on investment for the investors in Plaxo came earlier this year when the company was acquired by Comcast. Our current business model is a combination of Premium services and advertising. What can you tell about new features for Plaxo? What are must haves for you? As you may have noticed, Plaxo shows up in the majority of news announcements around opening up the Social Web. Plaxo is today one of the largest and most prominent OpenID Relying Parties (sites that accept OpenID). With Yahoo, Microsoft, Google, and MySpace really heating up the OpenID space working on a great end-to-end OpenID user experience is an area of critical focus. And that’s really all about getting not just the sign-on piece right, but leveraging the whole Open Stack to make onboarding to a new site as frictionless, secure, and useful as possible. I'd like to think I've got a pretty big digital footprint and participate in dozens of social networks and platforms. Initially I thought that Plaxo had a number of advantages. One was that it gave you more flexibility in managing groups than LinkedIn and you that with the new Pulse you could plug into tons of services. However, when I look at my own usage of Plaxo, I just plug in and let it stream, and it's what I see happening with dozens of colleagues. We sign up, use it for contacts, but that's it. In a way, Plaxo is converging channels into one stream, just like most sociall apps right now. This is, I believe the design flaw in the current web 2.0 landscape.In the past year I've thought a great deal about web 2.0 and how we deal with it, how we use it. We spread our names all over the web, signing up everywhere and leaving parts of ourselves all over. The major issues we have to deal with -in my opinion - are privacy and identity management which need to be elevated from a classical corporate solution to be web 2.0 ready. At plaxo, you've got millions of users putting private information into your databases. How do you deal with this? Where do you see Privacy going in this changing information age? As LinkedIn now is gearing up with adding more collaborative tools, it will be pretty interesting to see what the competition will bring us, users and if the world is big enough for multiple players in the market. 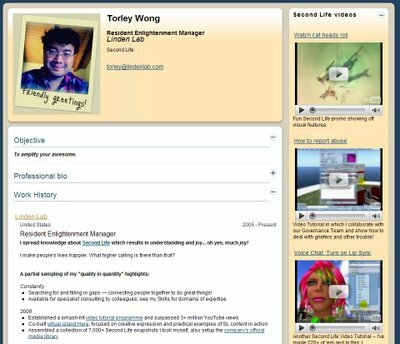 To be honest, I have spent more time and energy on my LinkedIn profile than I did with my Plaxo account, and although lately I'm starting to favor Plaxo a bit more, I think it's just not good enough yet to relocate my digital self. Both Plaxo and LinkedIn, as well as Facebook and oneConnect still have too many design flaws in common where it comes to Identity Management for me. At this time, they're players in the same yard to me, with each addition the scales might be tilting slightly, but I don't predict a big landslide here in the near future.